A lot of composers were inspired by Friedrich Nietzsche's poems. For this CD album compositions from Gustav Krug (1844-1902), Arnold Schönberg (1874-1951), Richard Trunk (1879-1968), Nikolai Medtner (1879-1951), Karl Weigl (1881-1949), Paul Hindemith (1895-1963), Ernst Pepping (1901-1981), Peter Ruzicka (* 1948) and Wolfgang Rihm (* 1952) were selected. That shows a spectrum from the turn of the century through the Second Viennese School and the Modern Age to the present. The rhythmic and metaphorical versatility, the playful connection of forms and content, philosophical references and their aesthetic-ironic transfiguration, give Friedrich Nietzsche's lyricism an exceptional status within the history of German-language poetry. Nietzsche's moods, which can be conveyed in a few lines, remind us of harmonious sound colors. 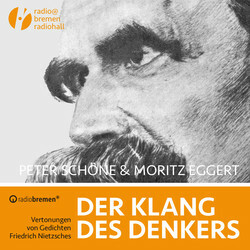 The intention of this compilation is to recapture Friedrich Nietzsche's linguistically »condensed« music. To translate them back into their basic form, and to let the musician Nietzsche sound in his lyric. The CD was recorded in the Sendesaal Bremen, produced by Radio Bremen. Peter Schoene was praised as brilliant baritone and ennobled as an excellent singer with outstanding technique. He has established his international reputation as concert, opera and lieder-singer. Schoene has won several competitions, including the Schubert-Competition in Graz and Bundeswettbewerb Gesang, and was prizewinner at the ARD. Since his opera debut as Eddy in Mark-Anthony Turnage’s opera »Greek« at the Komische Oper Berlin in 2002 Peter Schoene has sung almost every baritone role in more than 20 opera houses. Most recently he sang Faninal in »Rosenkavalier« with great success. A keen proponent of contemporary music, Peter Schoene has worked extensively with the pianist Axel Bauni and the composers Aribert Reimann, Wolfgang Rihm, Wilhelm Killmayer and Moritz Eggert. In acknowledgement of this work he was awarded the Schneider-Schott Music Prize by the City of Mainz. Moritz Eggert is one of the most versatile and innovative artists in the contemporary music scene. As a composer he experiments with different musical styles. Eggert is committed to a rethinking of contemporary music. The the fields of music theater Moritz Eggert has written 12 operas so far. Above an this he is focused on chamber music. His song cycle »Neue Dichter Lieben« and his piano cycle »Hämmerklavier« are proof of this. Eggert performs as a pianist, singer, conductor and performer. And he is not only active in the contemporary but also in the classical repertoire. For the Neue Musikzeitung, Moritz Eggert runs the »Bad Blog of Musick«. It is considered as the most popular blog about contemporary music in Germany.